In physics, it often seems that the theorists — the people thinking up new models and ideas to describe the natural world — get most of the glory. The Einsteins, Newtons, and Hawkings are generally better known than the people who do experiments. As a result, many of the great experimental physicists get overlooked even when we talk about important discoveries. However, without work in labs (and observatories), theories are no better than random thoughts; many theories have been ruled out by experiment, and forgotten as a result. The neglect of experiment in the popular imagination is completely unfair, though. 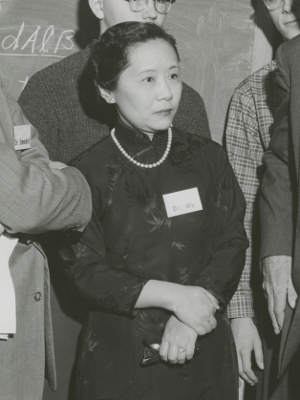 A case in point: the Chinese-American physicist Chien-Shiung Wu (1912-1997), known to many simply as Madame Wu, is not widely known by non-physicists, even though her accomplishments were many. Among other things, she worked on the Manhattan Project, did experiments in molecular biochemistry (on hemoglobin, for those keeping track at home), and was among the first to study quantum entanglement in the lab. However, Wu’s greatest experiment involved parity violation during beta decay. Parity, on the other hand, refers things that don’t change when you reverse everything: not just back-to-front like a mirror, but up and down and left and right. There’s no absolute up, down, left, right, back, and front in the Universe: all directions are relative to objects, such as Earth. However, most fundamental particles like electrons have a kind of internal compass: their spin. Spin isn’t quite like the rotation of Earth, but the difference isn’t important right now. (If you want to know more, see my earlier piece on electron spin.) However, spin is very important in magnetism: both in how permanent magnets work and in the way atoms respond to magnetic fields, which will be important soon. What we care about is that the spin of a particle doesn’t change when you do a parity transformation, even though the way the particle is moving does change. The diagram below should help you visualize that; it also helps explain why a parity transformation isn’t just a mirror-image. 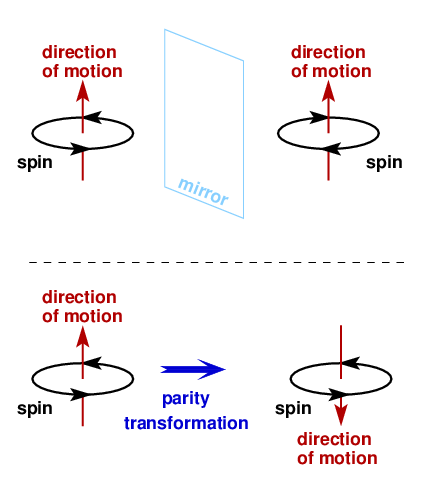 To put it an equivalent way, a parity transformation flips the direction of a particle’s motion relative to the direction of its spin. Most interactions in particle physics aren’t affected by a change in parity: if you shoot one electron at another and measure how they bounce off each other, then reverse the directions in which they move and repeat the procedure, you’ll get the same results. But the situation changes for some interactions involving the weak force, which is one of the four fundamental forces of nature, along with gravity, electromagnetism, and the strong force. (You can tell which ones were discovered last by the uncreative names they were given.) The electron collision experiment I described above is governed by the electromagnetic force, but the weak force plays a role in other circumstances, such as beta decay. The weak force could almost be called the “weird force”, since it breaks a lot of the rules obeyed by the other three forces—including parity flips. Wu chose an isotope of cobalt which doesn’t occur in nature: cobalt-60 (often written ), obtained by bombarding naturally-occurring cobalt atoms with neutrons. Cobalt-60 is unstable and radioactive, changing into nickel via beta decay, emitting electrons and gamma rays. However, a nucleus of also has a strong affinity to magnetic fields thanks to a relatively large spin. For that reason, Wu placed a thin layer of atoms in a strong magnetic field at 1.2° above absolute zero to minimize random fluctuations that occur at higher temperatures. With this setup, the atoms were aligned by the magnetic field; Wu then observed the direction in which both electrons and gamma rays flew out as the cobalt decayed. She found the electrons flew out preferentially in one direction—opposite to the spin of the atoms, no matter what the orientation of the magnetic field—while the gamma rays were emitted in all directions equally. 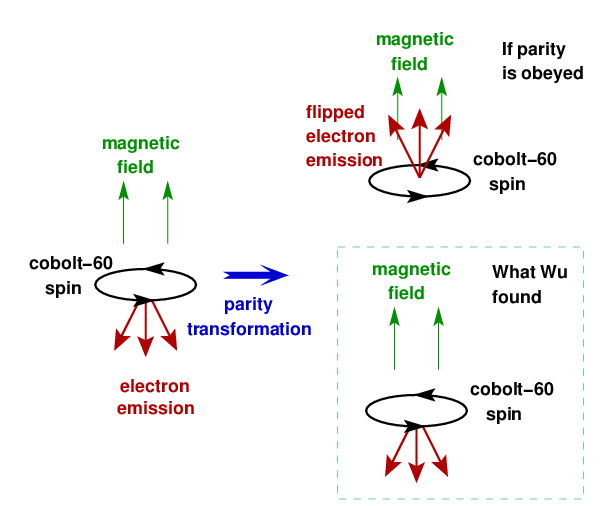 Like spin, magnetic fields are unaffected by a parity transformation, but electron trajectories should be. However, because the electrons were produced by a weak force interaction (beta decay), they flew out the same way every time. Wu had shown that the weak force violates the law of parity. That’s a pretty wild result, one which has been verified over and over in subsequent experiments. Parity is not a fundamental symmetry of nature, oddly enough, even though you’d never know it from daily life. Experiments like that of Chien-Shiung Wu help us reflect — literally in this case! —on the fascinating structure hidden inside matter.